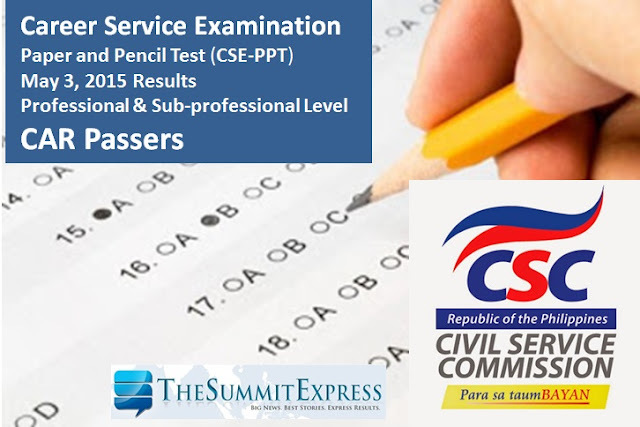 The Civil Service Commission(CSC) announced the results of May 3, 2015 civil service exam - Paper and Pencil Test (CSE-PPT) also known as Career service examination on Friday, June 12, 2015. The list of passers per region for the sub-Professional and soon for the professional level is available here. Examinees of the May 3, 2015 career service exam in CAR (Cordillera Administrative Region) may now check results on this webpage. A total of 180,680 registered examinees took the Civil Service Examinations in 52 test locations nationwide, according to CSC. The CSE-PPT is a general ability test designed to measure an individual’s preparedness to enter government service. Passers of the the May 2015 CSE-PPT exam must personally claim their Certificates of Eligibility at the CSC Regional Office/Field Office upon presentation of required documents. On the other hand, those who failed the examination may secure a copy of their Report of Rating through the CSC website. No Report of Rating shall be mailed to those who failed. To secure a copy of the Report of Rating, an examinee must key in his/her name, date of birth, examinee number, examination date, and examination type. Thus, examinees are advised to safe keep or remember their examinee number until receipt of the examination result. Like Us on Facebook or Follow Us on Twitter to receive updates for civil service exams. You may also subscribe to our RSS Feeds or E-Mail list.